As a mum, finding time to write is hard. As a mum who home-schools and works from home it’s even harder. It's something I've struggled with since starting writing in 2006. At first, I took advantage of the times when my daughter napped, or went to bed. But she stopped napping at 2 (very soon after I started writing! ), and these days I swear she would stay up later than I do if I didn't encourage sleep. For many years, this meant I just didn't write at all, especially when I started working from home two years ago. But in the last couple of months, after watching the success of self-published ebook authors, I've felt that I need to make the push to do something now. I needed to somehow find time to write so that I could get a book out there! Here are some of the methods that I have found helped me carve out writing time in my busy day. Yep, lots of people say this, and it's true. While I kept saying that I didn't have time, I didn't. But when I became determined, I somehow found time. Having a daily goal helps me to stay focused. But the 1600 words a day goal that I was used to as part of NaNoWriMo is just too much. With a goal that big, I don't tend to write unless I know I can sit down for a couple of uninterrupted hours. (Yeah, like that is going to happen!) Lately, after joining Holly Lisle's “Write a Book With Me” board, I've set a daily goal of 250 words a day. This seems incredibly small to me, and feels like it will get me nowhere. However, what it is, is achievable! I can write 250 words in under 10 minutes. No way can I say that I can't find 10 minutes a day! And the best part is, once I start writing, I nearly always write more than that. And if I don't, I don't beat myself up about it. I made my goal, and I start again tomorrow. People tend to imagine that writers revel in sitting alone and losing themselves in their imagination. While that is true to an extent (for some people! ), it's very nice to have someone to share your word-counts with, discuss sticky plot points, or someone to cheer you on. A good writing buddy or group, online or in person, can really keep me going. There are days when I've only done my 250 words because I wanted to be able to post to the group that I did it. Most of the above points deal with motivation to write. But once you're motivated, there is still the matter of sitting down and actually putting words to paper. Some days (like today), I'm lucky. My husband is able to take our daughter out for a couple of hours. He tries to do this a couple of times a week, giving me uninterrupted time to write. But many days this just isn't possible. On those days, the only way I get anything written is to use the little moments. I write when my daughter is watching her favourite TV program. I sit next to her on the couch with my iPad, so that I'm still nearby, and I'm right there if she needs me. I write on my iPad while I sit next to her at night as she goes to sleep. I'll even write in the bathroom while my daughter is having her bath. Every little moment counts. When I first started writing again, I despaired of being able to write anything in less than an hour. It took that long for me to get my brain into gear. And yet, as I forced myself to do a little bit each day, I fell into a groove. Writing becomes easier when you do it regularly. So try to write each day, even if it's just 250 words. The best thing about writing regularly, is that when you get a chance to have an uninterrupted block of time, you don't spend the first hour sitting around dribbling words onto the page. You can take off running. Using these tricks, I've managed to write over 22,000 new words on Reckless Rescue this month. I've almost filled the hole I had in the middle of the novel, and am on track to have it out by November. And I'm sure these will work for finishing up the next novel too. How about you? 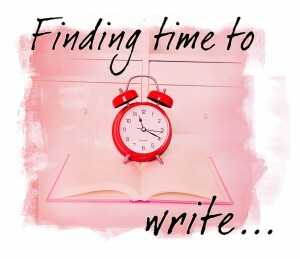 Do you have any good ideas for finding time to write? Thanks for the great tips! One of my biggest issues is the perfectionist tendency in me (I am definitely not perfect, just strive to have my work be the best that it can be). Often, I avoid writing because I am afraid a blog post will be subpar by my standards. I need to remember to just write and that every piece does not have to be perfect…any suggestions on how to get over that writing fear? Hi Donna. I think we all worry about our writing not being good enough, or being judged by others. With writing, I spent a good few of my first years telling myself that I’m writing for myself, and I never had to show my writing to others if I decided I didn’t want to. Then I used the “I can always fix it in the edit later” trick. And it’s always good to remember that rough drafts are just that, rough – they can be fixed in editing, but you can’t edit a blank page. Blog posts are harder, in some ways, because you’re writing them to send out into the world, sometimes straight away! It helps me to remember that everyone is human, and my blog posts probably will have mistakes, or make me cringe when I look back on them, but you have to start somewhere. So I just hit publish, then move on! Some blog posts will be good, some will be average, but that’s true of any blog, not just yours. Oh, and I always remember the quote about being perfect getting in the way of good enough!